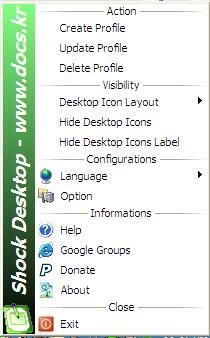 Previously we have mentioned IconRestorer to help you restore desktop icons layout to what you have arranged previously, now there is another utility, named as Shock Desktop that can help you restore desktop icons to previous one, besides being enhanced with capability to arrange desktop icons to different style of views as you preferred. Shock Desktop is a free utility that can arrange desktop icons to different style of views such as align to right, left, top or bottom, arrange icons in circle, ellipse, heart, star or twister, and change icons to polygon view like triangle, tetragon, pentagon many more. The transition speed is customizable and you are allowed to change the transition speed to the level that you like most. On top of this, you can create profiles to save current desktop icons layout so that you can easily restore the previous layout if icons position become scrambled especially after rebooting computer due to hang or screen resolution being changed. If you would like to clear all desktop icons temporarily due to some reason, instead of moving all files shortcuts located at desktop folder to somewhere else manually, Shock Desktop provides you the feature to hide and unhide desktop icons with just a simple click. Additionally, you can also hide desktop icon labels by displaying the icons without displaying the name. Shock Desktop v1.53 is absolutely free to download. It is compatible to run in Windows 2000/2003/XP/Vista. To experience it yourself, just download it at here.